to go to school, to learn to read and write. do not have access to primary education. and contribute to the rebuilding of the country. one child. one classroom. one school at a time. Every child should have the chance to go to school, learn to read and write. Several million children in Angola do not have access to primary education. empower communities, and contribute to the rebuilding of the country. 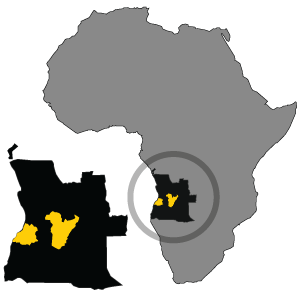 Located in southwest Africa, Angola is a country rich in natural resources and home to 28 million people. It was a Portuguese colony for nearly 500 years, then endured a brutal 27-year civil war which ended in 2002. The conflict left its cities, buildings and infrastructure decimated; its people displaced and suffering, most without access to clean water, healthcare and education.